Release Date:09/07/2018;Notes:Vinyl LP pressing. 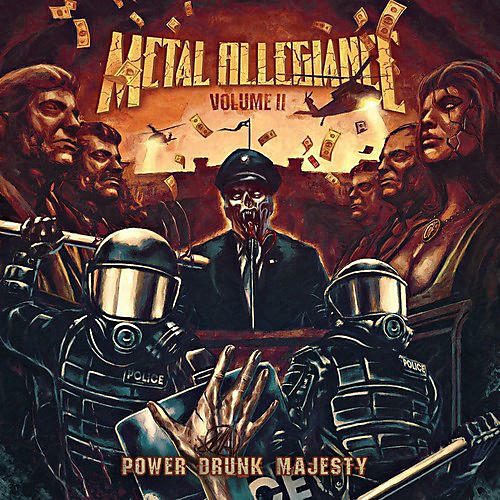 Volume II: Power Drunk Majesty presents a cohesive vision, a straight-ahead almost throwback thrash attack that's still grooving and modern. "With both albums we got together to see what would happen and in both situations, we surprised ourselves," says Skolnick. "On the first album, we were like kids in a candy store. It's a diverse record, which is great. On this one, we went for a more unified sound, and with fewer guests." On Volume II: Power Drunk Majesty, the core membership is once again strengthened by a small army of friends, an eclectic mix of metal legends, visionaries, and firebrands. Vocalists include: Trevor Strnad (THE BLACK DAHLIA MURDER), John Bush (ARMORED SAINT), Bobby "Blitz" Ellsworth (OVERKILL), Mark Tornillo (ACCEPT), Johan Hegg (AMON AMARTH), Max Cavalera (SOULFLY), and Floor Jansen (NIGHTWISH). Volume II: Power Drunk Majesty also marks the return of unofficial "fifth Beatle" Mark Osegueda (DEATH ANGEL) and Troy Sanders (MASTODON).